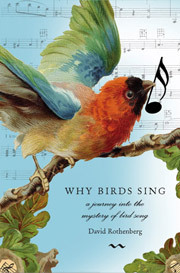 Why Birds Sing: A Journey Into the Mystery of a Bird Song is a book by musician and philosopher David Rothenberg. It is the first introduction to the world of bird song that combines the insights of science, poetry and music. It is a journey that begins with Rothenberg playing clarinet with lyrebirds and laughing thrushes to gain insight into what evokes their song. Rothenberg records duets in many places, including the Lamington National Park in Queensland, Australia.